Starting in 2001 when Jim Shaw, then-CEO of Shaw Communications, asked to have his portrait painted on his Harley, Manon Elder entered the tribal realm of the motorcycle world. 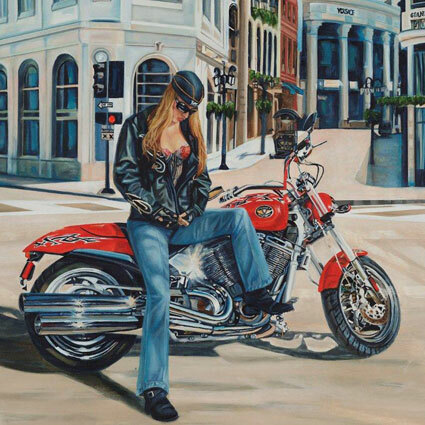 She centered on the Harley culture, as it was the only bike manufacturer that had initiated an art program as part of its marketing mandate and already had its star-artists Scott Jacobs, David Uhl and Tom Fritz producing a wealth of biker art. Elder travelled twice each to the rallies of Sturgis, ND, during August bike week and Daytona, Florida, during spring break in order to photograph the bikers firsthand. She then returned to her studio to create the highly-detailed canvases that garnered her 3 full color pages in October 2005 issue of Easyriders. Her work was exhibited at Sturgis in 2007 in the international exhibition curated by Michael Lichter. Since then her motorcycle art has been further showcased in motorcycle magazines in the United States, Canada, Russia and Italy.